At Brunswick Heads, turn left off the Pacific Highway following the Mullumbimby Gulgan Road Exit and signs. Go 2 kilometres, then turn right following the Mullumbimby sign. 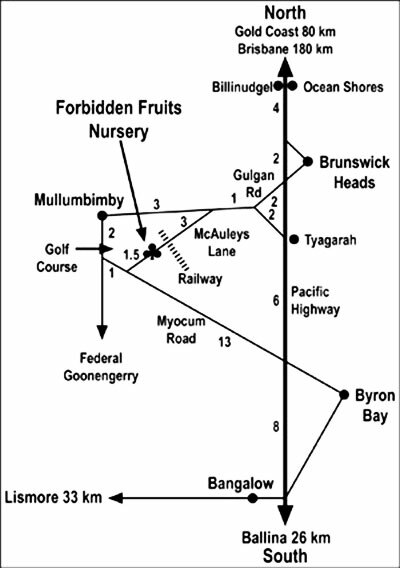 Go towards Mullumbimby township, after driving one kilometre, McAuleys Lane is the first road on the left hand side. Go along McAuleys Lane for 3 kilometres. After crossing a wooden railway bridge, the Nursery is signposted on the right hand side. Turn left off the Pacific Highway, onto the Mullumbimby, Gulgan Road Exit. Go 2 kilometres, then turn left again following the Mullumbimby sign.